The seventh edition of Clerkenwell Design Week (CDW) promises to be the best and most ambitious yet, as new locations, brands and installations join this vibrant festival in one of London’s most idiosyncratic and creative quarters. In a first for the festival, organisers have appointed architecture practice OMMX to create a strategic masterplan for the event. 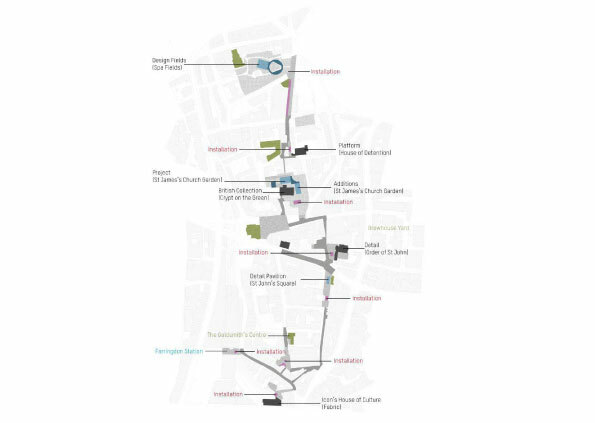 The plan marks a significant point in CDW’s development, with the format expanding to eight exhibition venues, a gateway destination to Clerkenwell’s showrooms, an installation trail and a brand new destination at Spa Fields. Clerkenwell Design Week, sponsored by Renault, will take place 24 – 26 May 2016 across Clerkenwell. New sites and structures will provide enhanced possibilities for exhibitions and programming; Design Fields, a large-scale curated exhibition of contemporary design, will be set in a specially constructed two-floor pavilion at Spa Fields, near the exceptional Clerkenwell destination of Exmouth Market. Design Fields is set to become a festival favourite with live content and temporary spaces designed to connect, relax and recharge. The park space at St James’s Church Garden will become a key destination as part of Clerkenwell Design Week’s new look with the new exhibition Project hosting leading international brands presenting furniture, lighting and product design, alongside the hugely successful interior products show Additions. A new show, British Collection, will showcase some of the UK’s most exciting homegrown talent within the barrel-roofed Crypt of St James’s Church. Each will enhance the wellestablished CDW exhibitions; Detail at the Order of St John and pavilion on St John’s Square and Platform at the unique underground space House of Detention. Long-time collaborators Icon Magazine will again stage Icon’s House of Culture exhibition at another iconic Clerkenwell destination; Fabric. Underpinning Clerkenwell Design Week, the area’s multitude of design-led showrooms is a vital part of this unique event. For the first time Brewhouse Yard off St John Street will act as a gateway to the showrooms, many of which are clustered close by. In addition, the Goldsmith’s Centre on Britton Street will also join the festival as a key destination for live content with fresh programming and activity throughout CDW. For 2016 London designers Studio Parallel have created a new visual identity for this year’s festival. The campaign, ‘Covered’, plays to the strength and variety within Clerkenwell Design Week, through five thematic images from furniture and lighting, design talent, to materials and architecture, all unified with the festival’s signature colour, magenta. Paul Fox, Creative Director of Studio Parallel, said; ‘We feel that it’s the right time for a change in design direction. We worked to achieve the right balance to add a new visual narrative, and still make it instantly recognisable as Clerkenwell Design Week to the audience.’ Set designer Kei Yoshino and photographer Lydia Whitmore collaborated to bring the themes to life. Clerkenwell Design Week 2016 will celebrate the extraordinary creativity of the area with hundreds of events, from site-specific installations and new launches, to workshops and thought-provoking debates across a huge range of venues. William Knight, Show Director, Clerkenwell Design Week, said; ‘The expansion of Clerkenwell Design Week‘s exhibition programme to eight major locations is a sign of how dynamic the creative industries are in this area, and a testament to the successes of previous years’ shows. We have new exhibitions, a new masterplan and a new visual identity. But it is the energy and sense of community among architects and designers here that inspires us, and helps make the festival so unique in London.’ Festival events take place across Clerkenwell, and registration is free.